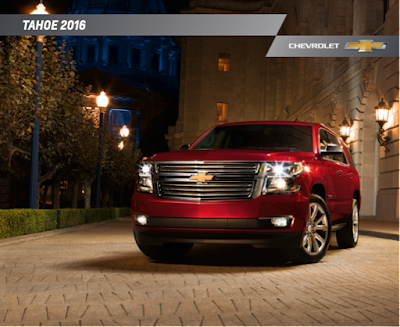 ELIZABETH CITY, NC –– The 2016 Chevrolet Tahoe is all about sophistication, refined craftsmanship, and capability. It’s no wonder this SUV has been honored by MotorWeek with its 2015 “Drivers’ Choice Award – Best Large Utility.” Learn everything you want to know about this award winner SUV by downloading the 2016 Chevrolet Tahoe brochure below. The 2016 Chevrolet Tahoe boasts an interior that blocks the world out and connectivity that keeps you in touch. The clever storage areas, power-release flat-folding seats, and hands-free liftgate allow versatility in each trip you take. An outstanding 94.7 cubic feet of cargo space is available with the second and third row seats flat. The refined interior style with leather appointments, soft touches, and wood grain details create a sense of luxury. Technology you’ve come rely on comes standard with the 8-inch color touch screen. Chevrolet My Link, Bluetooth, Sirius XM, rear Blu-ray system, and standard OnStar built-in 4G LTE Wi-Fi will keep you connected and entertained. You’ll always stay fully charged in the Suburban with the available wireless charging pad and six USB ports to connect. Download the 2016 Chevrolet Tahoe brochure to decide which features you want, then stop by Perry Auto Group to purchase or lease your 2016 Chevrolet Tahoe. Perry Auto Group has two dealership locations to serve you better at 1005 W. Ehringhaus St, Elizabeth City, NC, 27909 or 1001 Halstead Blvd Elizabeth City, NC 27909. Stop in for any of your auto or community needs, or feel free to give us a call at (252) 338-9100.